This is actually a success story. I haven't shared any success story with you yet. And to be honest I didn't have any notable success earlier. I was just writing and writing. And continuously trying to help my readers just for nothing. Because visitors' feedback's, comments, opinions give me the mental satisfaction. Marks PC Solution got AdSense ads more than a year ago. But due to some compliance problems, AdSense rejected my site for 5 times! And after waiting for a long time, I applied for AdSense again. And this time my site was strong enough and got approved by AdSense. And I've earned more than $700 from AdSense so far. However not a single dollar is in my hand due to the transaction problem! Couple of months ago, I got an advertisement offer from 360 Adds through +Anzaq Ali. At first I thought this is fake offer. I got these types of offers earlier. And I was only interested to monetize my site through AdSense. But Anzaq was able to convince me. And later I accepted his offer. After running the ads for the first month, I made only $ 115 which is equal to Tk. 8800. Anzaq paid me through Western Union. To be honest, I was really excited even with such a low amount of payment. Because that was the first earning of Marks PC Solution! Then Anzaq told me to place the ads under the post title and below the post. As I have more than 3000/ 3500 unique visitors per day, they will be able to pay me up to $ 300. After placing the ads in more places, I was getting 8/9 (in average) dollar per day. Though it should be $10 in order to be paid $300 per month. Still I was happy. Then I've earned $186 in the month of February. But my payment threshold is $250. So I was not paid that time. On 9th March, my total earning crossed $500. 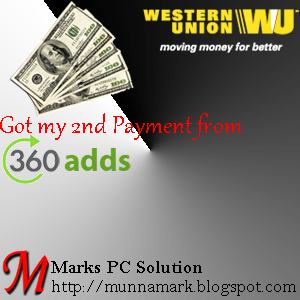 Then my account manager Anzaq paid me $440 through Western Union. And I got only $376! In fact, I was shocked. Maybe the charge of Western Union is little bit higher. Now I'm thinking of new way of payment. This could be Payoneer Free Master Card. And I think this will be less costly. Earlier Western Union showed detailed information of a transfer. But now it doesn't show the amount. Maybe it's to tighten the security. Do you have a site with more than 500 unique visitors per day? And do you have more than 2000 real pageviews? If the answer is NO, then you have to wait. Try to make your site stronger. If the answer is YES, then what are you waiting for? Why don't apply now? After sign up for 360 Adds, an agent will review your site. If accepted, then the agent will tell you the procedure to place the adds. Do you see the Download Now button just below my post title and at the end of post? This is the Ad. You have to place the same button. Or it could be little bit different depending on your site. Maybe you never left any comment. For how many days you're with Marks PC? Thanks for sharing this post. Let me know hot to show this ads before and after a post? Is your site accepted? Your account manager will tell you the procedure. But if you can't do it, then talk to me through Google Talk. Place the code in every four sections. But what about Infolink?? Did you get any payment from them? 360 Adds will pay you 20 times more than infolinks! Brother I can pay you more than Anzaq and in advance if you want :) No one can beat me in the market regarding the rates. I have higher rates than any one other. If you don't believe, get in advance and then put my ads on your blog. You should have at least 500 visitors per day. If your account is approved with low visitors, then payment will be too low. So try to enrich your site to get more visitors. In case of online earning, don't be hurry. I've prepared my site for 2 years without any earning. And now I'm getting the result. I have messge on G+ will u ans me there?? Got Approved my account. Any suggestion How I start my work now ? Code should be placed just before and after- data:post.body of your template. Place the code in every four places. And talk to your Account Manager for details. hey bro i have more than 5000 vitors on my site how much i can earn?????? What do you mean by 5000? 5000 pageviews or 5000 visitors per day? earning is too low my daily pageviews are 12000 and earning is 0.50$ something what is this?? Sites with downloadable contents will earn more. What's your site is about? I recently applied for it and got approved. I am little bit confused that will this ad network really works as I have never heard about it earlier. I have 2000+ unique visits per day, how much I will be able to make? Currently I am using adsense on my blog and not making more then 3 dollars per day as cpc is very low. Revenue depends on how much downloadable contents you have. A site with high downloadable contents will earn more than informative sites.